The Rothman Institute Ice Rink Opens Friday! Warm up with hot seasonal cocktails featuring Jim Beam Apple cocktails and Sam Adams craft beer and an artfully-crafted menu at Rothman Cabin with offerings from Air Grille by Brûlée Catering including items to savor and share such as poutine and chili. Brush up on your skating or just watch and enjoy the great food and drink. Adults 21 and over can enjoy a glass of wine, a specialty cocktail featuring Jim Beam, or a Sam Adams craft beer starting at 5pm on weekdays, and 11am on the weekends. Visit DilworthPark.org/rothman-cabin for more information. New this year, a holiday-inspired Garden that was created in partnership with Greater Philadelphia Gardens. Located on the Greenfield Lawn, children and adults will delight in discovering picture-perfect moments amid the vibrant plantings, topiaries, twinkling lights, and décor that showcases all 32 public gardens, arboreta, and historic landscapes that are located within 30 miles of Philadelphia. Anchoring the center of the maze will be a welcoming gazebo. Visit DilworthPark.org/americas-garden-capital-maze for more information. In January and February, join America's Garden Capital for a variety of gardening programs in the Rothman Cabin that will have you dreaming of spring! Click here for a complete schedule. The Rothman Rink offers skating lessons for everyone, with 30-minute lessons, led by professional instructors. Includes a 5-visit punch card for public skating admission that is valid only during the 5-week Learn to Skate session. $99 per 5-week session. Includes lessons, admission and skate rental. Click here to sign up. All aboard! 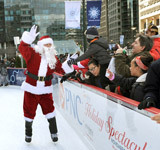 Santa Claus is comin' to the Rothman Rink at Dilworth Park on SEPTA! Board specially decorated SEPTA trains filled with entertainment for a fun-filled holiday ride to Dilworth Park. Visit SEPTA.org for train times and locations. A festive parade will welcome Santa, Mrs. Claus and the elves to the Rothman Rink, where riders are invited to stay and skate with Santa. The rink will be open 10am-11pm on that day. The Rothman Rink is accessible for everyone again this season. With sled skating, adults and children with disabilities can reserve a sled to use during these scheduled sessions. Reservations required. For questions about this program or to reserve a sled, email sleds@rinkmanagement.com. Calling all zombies on Friday the 13th! Come dressed as a zombie and be entered to win a special prize that includes free tickets to the Rothman Rink, along with zombie-themed food specials in the Rothman Cabin. Kids are invited for some pirate adventures and princess tales. Come dressed as your favorite princess or swashbuckler for an afternoon of sailing and twirling around the Rothman Rink. Kids can also keep busy with make-and-take crafts, along with complimentary face painting, and other activities. Come on out and skate to a healthy new you! Ice skating burns 250-670 calories in 30 minutes! Explore other resources onsite to help you keep that New Year's resolution! Buy one admission and get one admission free to skate with your sweetheart. Come and skate to love songs new and old, and remember this special evening with a rose and a keepsake photo. Make-and-take Valentines and special chocolate treats will be available inside the Rothman Cabin.